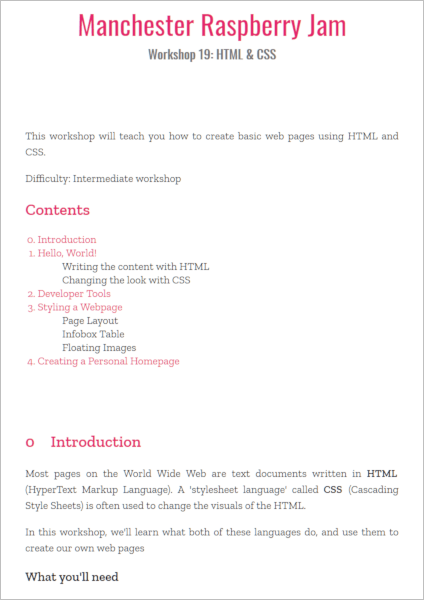 Workshop 19 covers the HTML and CSS, the languages that most web pages are made with. Most pages on the World Wide Web are text documents written in HTML (HyperText Markup Language). A ‘stylesheet language’ called CSS (Cascading Style Sheets) is often used to change the visuals of the HTML. 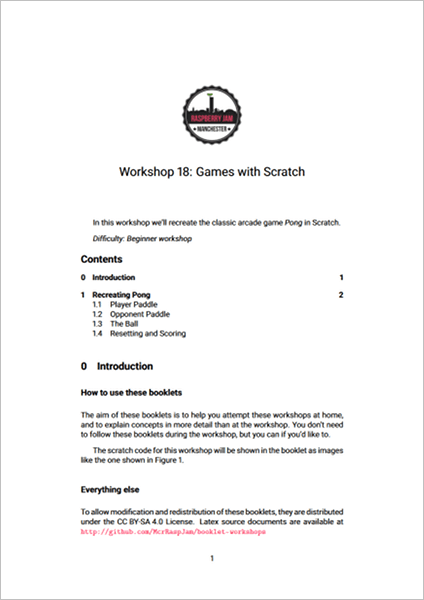 This is an introductory workshop. copy of the ‘Pi Edition’ of Minecraft. to modify the game world. before, but all of the programming concepts are covered from scratch. 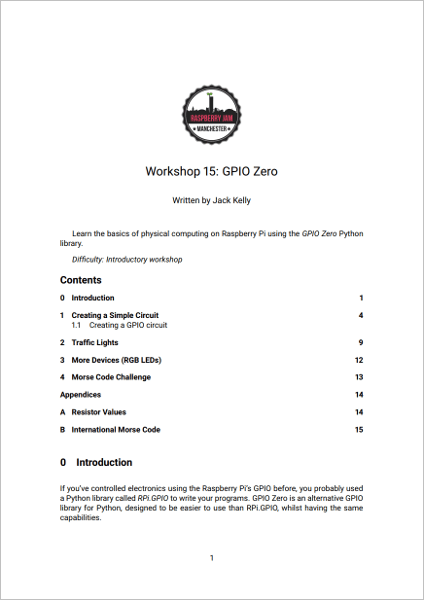 Workshop 15 focuses on the basics of physical computing on Raspberry Pi using the GPIO Zero Python library. Manchester Raspberry Jam is going on summer holiday, and will not be running in July or August. Our next event will be on Saturday 9th September, the details of which can be found here. 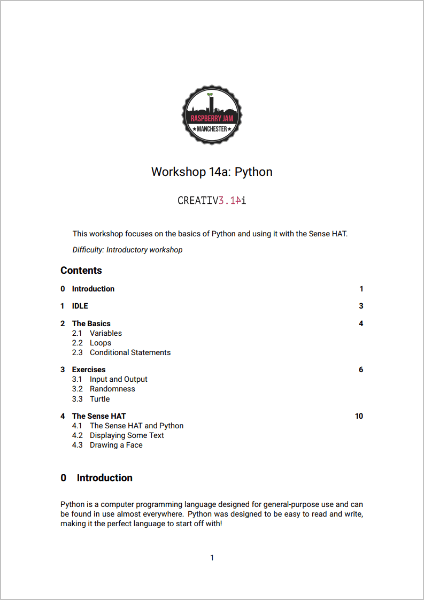 Workshop 14a focuses on the basics of Python and using it with the Sense HAT. 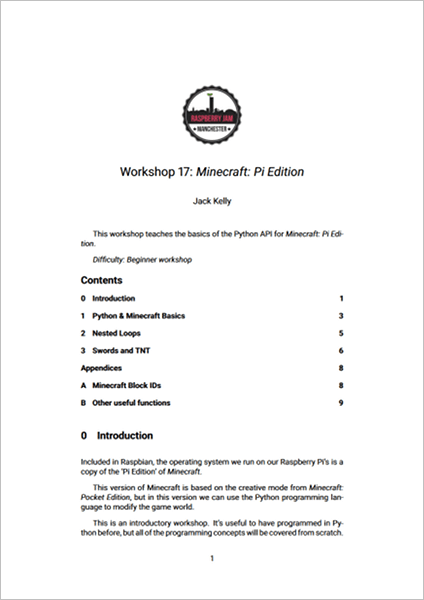 Learn how to boot your Raspberry Pi, then have a go with the Python programming language, before moving on to its use within Minecraft: Pi Edition, and a demonstration of using the popular Sense HAT addon board. Start with a command-line version of Raspbian, and learn how to install a GUI of your choice. 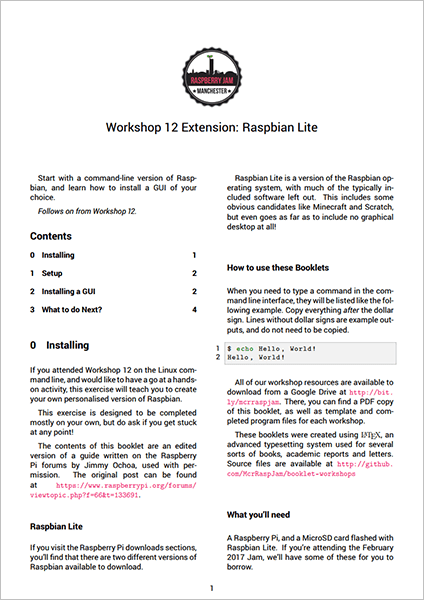 If you attended Workshop 12 on the Linux command line, and would like to have a go at a hands-on activity, this exercise will teach you to create your own personalised version of Raspbian. On a Linux computer the desktop only scratches the surface of the programs and functionality available. Linux users often access these additional features through a terminal window, using the Command Line Interface (CLI), a non-graphical user interface. For many tasks, creative use of command-line commands is much faster than their GUI counterparts, especially in bulk tasks. We’ll only be able to take a look at the very basics today, but Linux geeks swear by the fact that each new trick they learn in the CLI allows them to save a little more time when using their computer. This is an introductory workshop. 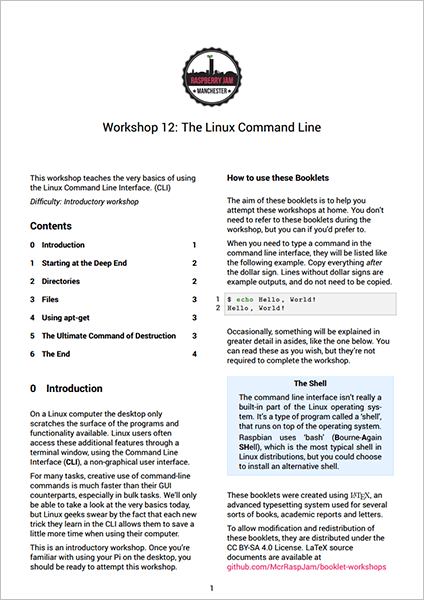 Once you’re familiar with using your Pi on the desktop, you should be ready to attempt this workshop. Workshop 12 explains how to use a motor controller chip, and how to make a breadboard circuit to drive a motor. 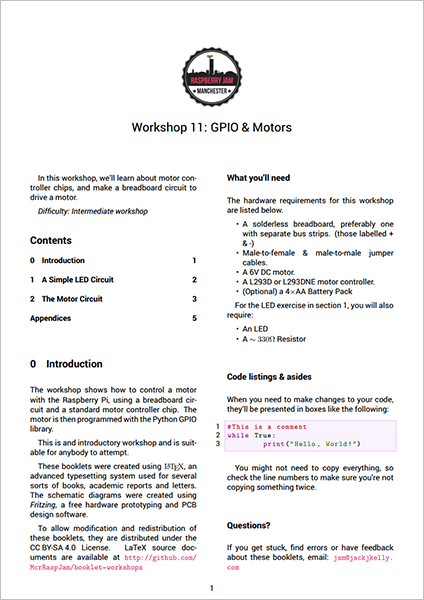 The workshop shows how to control a motor with the Raspberry Pi, using a breadboard circuit and a standard motor controller chip. The motor is then programmed with the Python GPIO library. This is an intermediate workshop, it will help to have some previous experience with Python. Our October Jam was at The Shed on Saturday 8th October.